What do you do when you have an abundance of beautifully colored mother of pearl shell pieces?? You make beautiful and unique one of a kind necklaces! This beautiful piece features a Baroque Blackish Grey MOP shell flower necklace sewn and wire braided onto a weaved leather cord. These stunning 3 flowers feature multi colored fresh water pearl centers. This is definitely a statement piece that is truly one of a kind. This piece is perfect for a stylish tropical getaway, a fancy night out, formal dinner, or any top of the line event where you NEED to stand out. This piece is part of our MOP Shell necklace collection that is available for a limited time only, so don't let this beauty linger in your cart for too long or else someone else will snag it before you do! 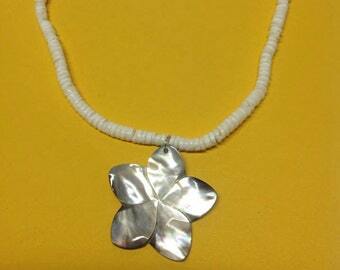 White shell mother of pearl tiare flower necklace. 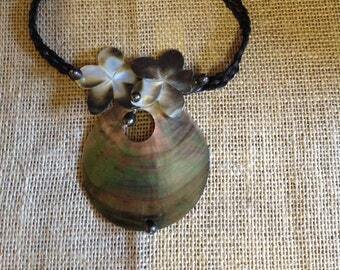 Carved Mother Of Pearl Shell Necklace And Pearls. 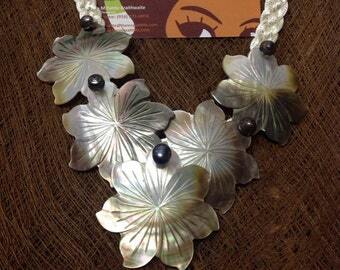 Mother Of Pearl Shell And Black Pearls Necklace. 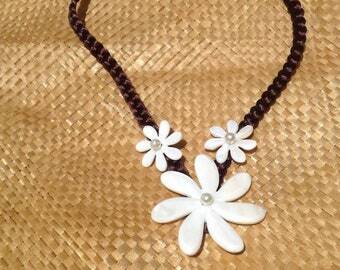 Perfect For Those Polynesian Event, Polynesian Dancers, Luau, Or For A Perfect Gift !! 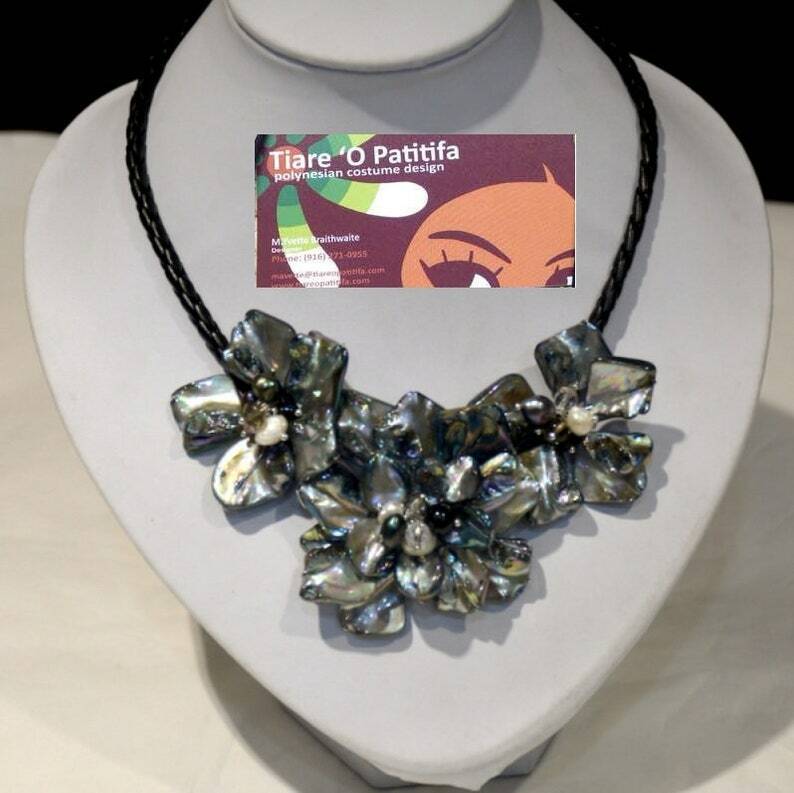 Mother Of Pearl, Abalone Shell Necklace with Fresh Water Pearls. 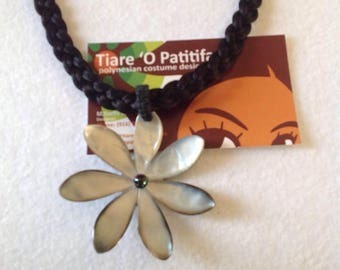 Tiare Flower Mother Of Pearl Shell Necklace. Perfect For Soloist, Dancers, Wedding, Luau, Gifts. 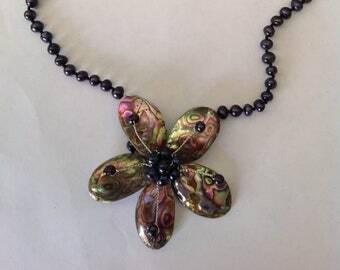 Mother Of Pearl And Black Fresh Water Pearls Necklace. 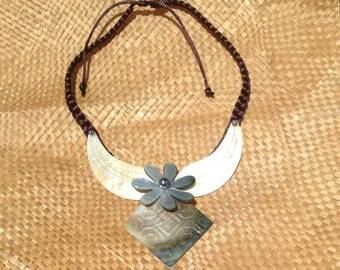 AUTHENTIC Lauhala neck piece. We can make it to fits children & adults.